I'm designing my own GPS logger and yes, I know you can buy them for relatively little money, it's more an project to bring my soldering skills up to the next level with QFN/DFN ICs and 0402 components and 1.5 layer routing, and I've selected the Fastrax UP500 module which has an integrated ceramic patch antenna. I cannot find any information on with what I can cover the antenna with, metal would clearly be out of the question, but how thick can a plastic cover be? Is the antenna already compensated for some plastic covering? The module datasheet has no info on this. How sensitive are these kind of modules to internal EMI, should I go through the trouble of completely encasing the processing module in umetal, or would just a shield underneath the module be enough? The module will not be fitted onto the PCB but wired to it with a little wiring loom; the device form factor is a little canister (like for example the Holux M-241), so it can hang off my camera or tripod with the antenna pointing up. I've not had any problems with internal EMI using a Telit module with a PIC, on an ordinary double-sided PCB. Did your design include a switcher, a graphical LCD, a switched capacitor white LED driver and a switching Li-Ion battery charger? 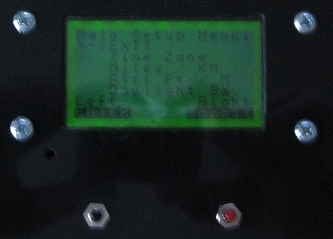 Now the latter does not matter, because the GPS is not intended to work while connected to a computer via USB. I know the UP500 has it's own SMPS so I guess an external one is no problem either. No, it was a GSM/GPS tracker for dogs and didn't need all that stuff. I don't see why there should be a problem though. 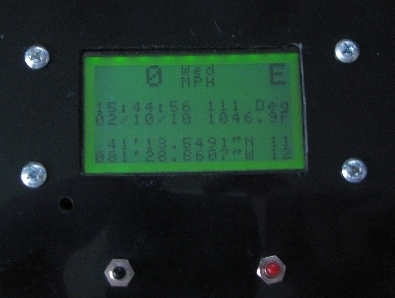 I've got a few GPS's in vehicles doing data logging. They all use the EM-406 with a patch antenna, and sit in plastic cases, within the vehicle's interior, (not in the engine compartment, trunk, etc.). They lock on and work fine. They have a Mega and a Bluetooth module, SD card, etc., but use linear regulators. I did another GPS for kicks when Microcarl sent me some GLCDs. Used my origninal prototyping EM-406 and a M328. It all sits in a rather large plastic box, (what I had available), and the GPS is double sided sticky taped to the top of the box. No RF link or SD on this one. Uses a linear regulator. Great lock on and no problems. Quickie pictures as I am the night doc tonight...No photo of the GPS tracking my path, as it isn't too exciting looking at one dot from my position at my work bench. The 11 is the number of satellites used in the calc's, (by the GPS), the 12 is the number of Sat's in view above the horizon. The rest is self explanatory. Programmed with Bascom. The GPS module is fed directly by the battery via a MOSFET to be able to turn it on and off, the DC/DC is only to supply the AVR, display and the DataFlash which do not consume that much. Only the DataFlash can consume up to 80mA when writing, but that's only once a minute or so for ~80ms. So I guess I won't have problems. As a general rule, it is desirable to avoid black plastic between the antenna and the sky because carbon is usually used for the coloring agent. Depending on the plastic, and how much coloring, the material thickness, and some other things, it could make a little difference or a bigger difference. It might also be hard to tell. 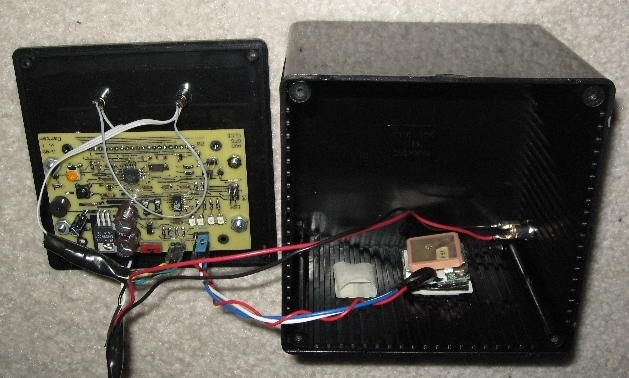 The GPS receivers are built to tolerate some signal loss (such as happens when tree tops are in the way) and some black plastics may be no worse than that. The "detuning" will depend on how close the antenna is to the shell of the box. So, there is no firm "right" setup. Oh man, live and learn. Guess I was lucky on that account, but I've had no problems with any of the units. Doc - it can be pot luck as to what will cause problems and what wont. I had a similar problem with insulation washers I had made many years ago - seems there's rubber mat and rubber mat - one has carbon in it and one doesn't. Guess which one I got? The arcing and smoldering was the giveaway. I just emailed Fastrax support, let's see what they say. When I asked them about the backup battery circuit arrangement I received a reply the next day. "Antenna cover gap 1mm to antenna top. Up to 2mm plastic cover thickness is OK, suitable material e.g. ABS".